Much as he wants to get away from it, the Beatles thing continues to dog Noel Gallagher, long after his band Oasis has broken up. Of course, that group got the comparisons, in part from the younger Gallaghers in the band doing some boastful claims. Plus they had some great songs that held up British rock at a time when it was sinking into synths. 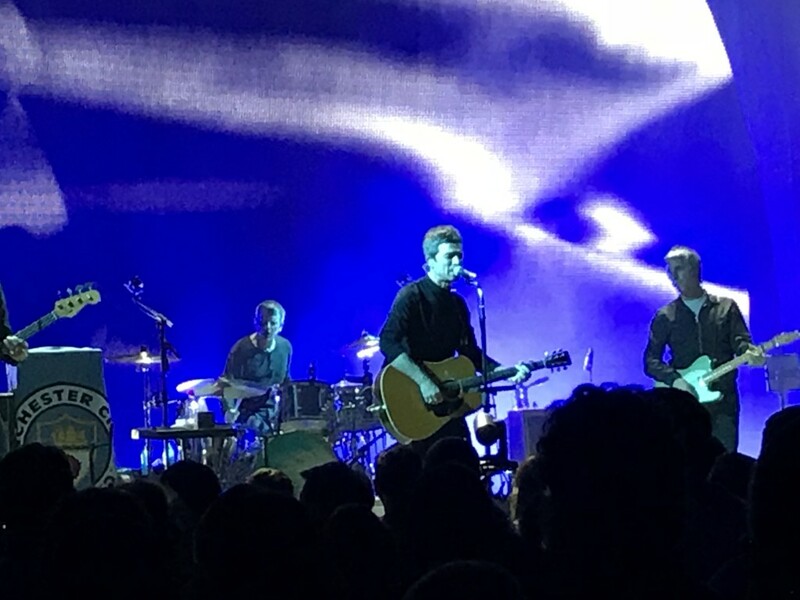 Now on tour to promote the third album by Noel Gallagher’s High Flying Birds, which stopped at the Anthem in Washington, D.C., Monday, he’s acting like a solo Beatle immediately after their breakup — downplaying the work of his old band, even though that was the stuff that really got the crowd going. It was reserved seats all around for the Anthem show — an odd choice, since old Oasis fans aren’t quite that old yet, and Gallagher’s music maintains an edge and a rocking core. But everybody stood from beginning to end, owing to how compelling so much of his new music is. Gallagher has always had a knack for rock-based hooks; by now he also uses that cleverness to devise songs that work because of their simplicity and the kind of repeated phrases that bolstered rock ’n’ roll from the outset. With a swirl of arresting video on a circular screen behind him, he and his various Flying Birds appeared at first as mere silhouettes against the screen before a staccato barrage of lights illuminated the musicians. Now 50, Gallagher looks much as he always did — lean and cool in his black turtleneck and leather jacket, his hair in a Roman cut that predates the Beatles, the everlasting scowl framed by a few more distinguishing lines. His band has the power to enliven his material, expanding from a low of five on stage to a maximum of a dozen, including three backing vocalists and a three-man horn section. The show, which didn’t have an opening act, had a marvelous beginning, with the opening “Fort Knox” seemingly building out of jazzier interpretations of that theme in the pre-show tape. Things seemed a little ragged at times later, something the dour Gallagher didn’t miss in pointing out during musicians introductions of the core touring band who had roots in Oasis, from guitarist Gem Archer and drummer Chris Shamrock to onetime Oasis session pianist Mike Rowe. They are augmented by bassist Russell Pritchard, and the key addition of Jessica Greenfield on harmony backing vocals and keyboards. Rounding out the outfit is the mysterious Charlotte Marionneau, who shouted phrases in French with a megaphone at one point, and the even more mysterious soul singer Yseé, who doesn’t seem to have any further name. In that enduring and oft-covered anthem, he dissuaded pure singalong by giving a different inflection that moved to blue notes in the chorus. He left the entirety of the chorus of “Don’t Look Back in Anger,” though, to the delirious fans who were happy to shout them in the encore. And how to follow that? Well, said Gallagher, “speaking of bands from Liverpool,” a shaky version of The Beatles “All You Need is Love” — minus strings but with the horns.